The painted cart rolls into town, pulled by a couple of weary horses. Men in brightly-coloured clothing emerge and the curious townsfolk gather around them. There is music and magic, juggling, flame throwing, a ventriloquist. And there is a storyteller, drawing in the listeners with his frightening tales of deadly plagues. But fear not, he also brings tidings of wondrous protections and miraculous cures. Someone amongst the crowd testifies that, yes indeed he returned from the very doors of death due to this man’s marvellous medicine. The crowd clamours for this extraordinary elixir. Those not yet convinced are pointed out; “Won’t you be the foolish one when everyone is protected bar you?” They too succumb and part with their hard-earned coins. And as quickly and suddenly as the travelling show arrived, it is gone. 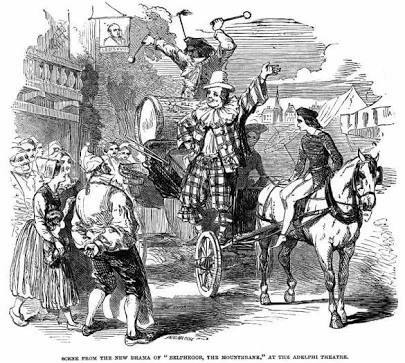 Such travelling medicine shows date back as far as the Dark Ages in Europe, back to an era when other forms of entertainment such as circuses and theatres were banned. 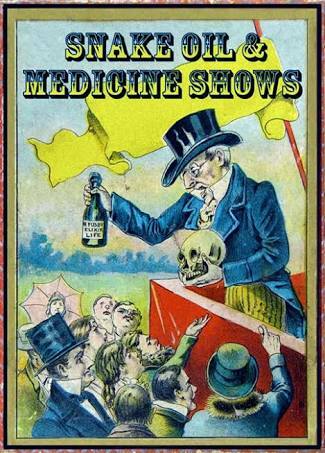 In some areas these hawkers of miracle cures were called mountebanks, in France they were known as charlatans. The tradition was transported to the colonies, including the US where it continued on through the 19th century. 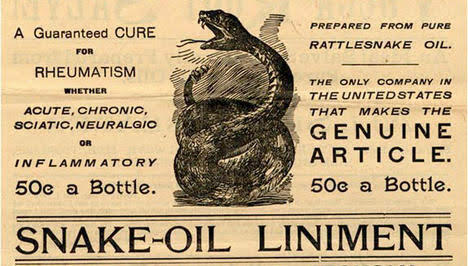 These sellers of ‘snake oil’ would roll into town, provide entertainment to rural communities where there was little else available, tell tales that instilled a sense of fear or need into their rapt audience before making grandiose claims about the curative properties of their product. These potions generally had no medicinal attributes whatsoever but often contained stimulants such as alcohol, opium or cocaine, which at least made the purchasers happy with their transaction in the short term. By the time buyers’ remorse had set in, the show had already left town. It was a classic ‘bait and switch’. What finally brought these schemes to an end in the US in the early 20th century were the advent of other entertainment forms, most notably the cinema, and the government regulation of medicine through departments including the FDA and AMA. What may also have contributed was the population’s increasing awareness of the use of ‘pseudoscience’ as a marketing technique. Pre-Enlightenment populations could be forgiven for falling for the salesman’s spiel, not having our luxury of access to scientifically proven data. However, we are all still familiar with the marketing techniques employed by the travelling medicine shows, broadcast 24 hours a day on our shopping channels and with figures like Dr Oz given a platform by the likes of Oprah Winfrey. Why, in spite of the progress made in science and the scientific consensus that now exists in so many aspects of our lives, are we still susceptible to pseudoscience and quackery? In spite of the many advances of science which have improved our everyday lives, many people still remain sceptical. Undoubtedly scientific developments have not always had positive outcomes (the nuclear bomb and other weapons of mass destruction would be one obvious example) but scientific evidence can also present a challenge to people’s strongly-held beliefs and ideologies. To those for whom free-market ideals are essential, science can pose a threat as it can lead to regulation. Libertarians may resist scientific evidence which supports the imposition of mandatory behaviour (such as vaccinating children). Science can be seen as a challenge to religious doctrine, as in the case of evolution and creationism. People with a distrust of big industries, such as ‘Big Pharma’, may challenge the science along with the business ethics of such corporations. Added to these ideological barriers, there is also the fact that scientific findings can often be very counterintuitive. We tend to find randomness very difficult to process and this can lead us to seeing causation where it doesn’t exist. We are more easily influenced by personal anecdotes than statistics and the results of years of peer-reviewed research. On top of these factors, there is also the issue of industries and companies funding scientific research for those willing to cast doubt on any scientific consensus seen as detrimental to that industry. Many of the same scientists who were bankrolled by tobacco firms to cast doubt on the links between smoking and cancer are now being funded by fossil fuel giants to lead the cry in climate change denial. These ‘findings’ are then grasped upon by the media and disseminated on the internet, which results in the magnifying of their significance and validity (For more on this topic, Merchants of Doubt by Naomi Oreskes and Erik Conway is essential reading). Even when such ‘bad’ science is debunked, it is very difficult to make people change their minds. Whatever a person’s reason for doubting science, it is important to remember that science denial can be deadly. Even now, 18 years after the report linking the measles vaccination to autism was debunked and retracted, there is still a vocal and powerful anti-vac movement. Vaccination rates in the US are the lowest they’ve been since they first became available. Who will take responsibility when an outbreak of measles occurs and claims children’s lives? 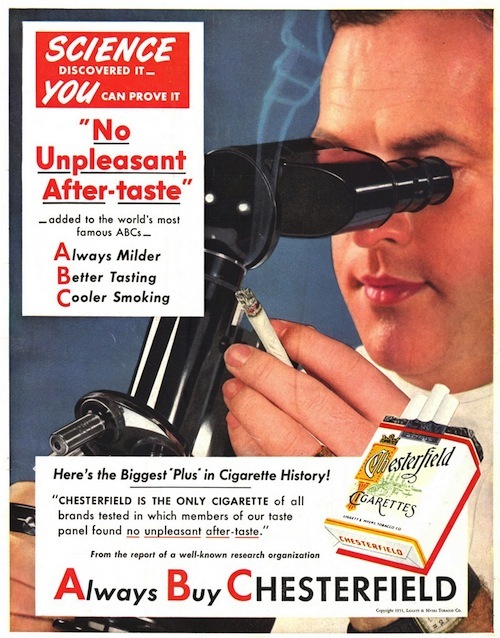 How many smoking-related deaths were there before the tobacco industry admitted that they knew about the health dangers? What will the global consequences be of delayed action to combat climate change? The way to overcome the misinterpretations, misunderstandings and mistrust of science is through education. The teaching of scientific thought and processes, not just science itself, is essential. People need to understand the scientific method and consensus gained through peer reviewing and result reproduction, to know how to recognise and debunk pseudoscience, how to separate statistical evidence from anecdotal. People need to be taught how to identify the truth amidst the lies and misinformation. Otherwise, we are all vulnerable to a colourful, flamboyant, entertaining man who comes to town spreading tales of threats and dangers; a charlatan who bombastically claims that only he has the cure. National Geographic Why Do Many Reasonable People Doubt Science?